In the last 5 years, monsoon has been irregular and uneven in almost all the parts of the world. India has suffered greatly to this regards and rightly so. The newly founded love for industrialization has resulted in cutting off trees and creating pollution. Delhi is amongst the most polluted cities in the world after China. Imagine how much we are striving to make our own home unlivable. However there is a silver lining in the dark cloud. People are gradually realizing about the need to protect, conserve and increase mother nature. They plant trees. Some people have even dedicated their entire lives in planting trees for the benefit of the people and have died in the process. People like me do this occasionally on birthdays and other events. Some days back, I had an urge of planting seeds or plants on the occasion of my birthday. I could not arrange for the plants till the last minute. But as is the norm, we have a superwoman in every household known as Mother. She arranged for 3 plants in the last minute and my plan came to fruition. I along with my parents had the opportunity to give something back to nature. I planted 3 plants on my birthday before going to office. 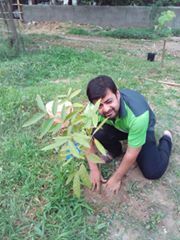 I understand that planting trees is alone not sufficient as one has to nurture them like kids. That will also come to fruition as the days pass. Additionally, mother nature smiled on me as rainfall has been happening since that day. A proof that she approved of my small contribution. I request whomsoever is reading this post of mine to do likewise and plant atleast 1 tree on their birthdays, anniversaries and similar occasions.